The TNT KaTropa showcased their full offensive repertoire in their blowout win against the Columbian Dyip. Six KaTropa scored in double figures as the team shot 54% from the field and had 35 assists. This was a wire to wire win by TNT. After a 2-2 tie early in the game, the KaTropa went on a 12-0 romp to build an early 12-point lead. 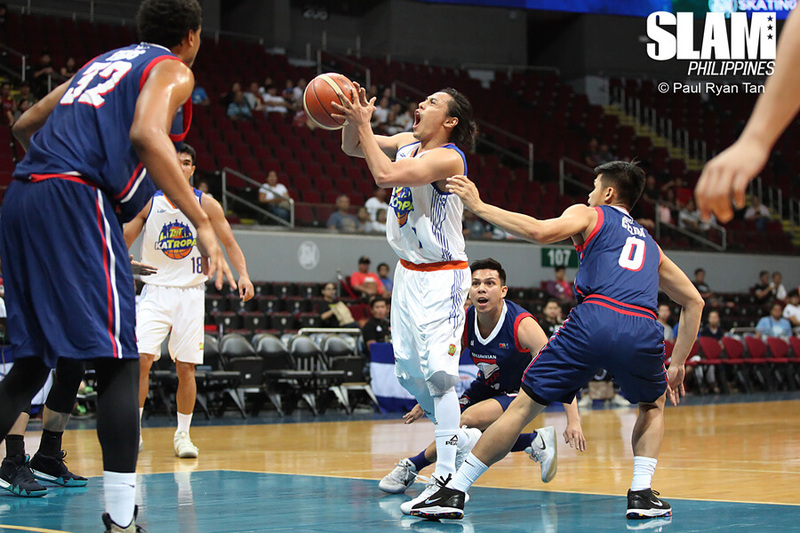 The run was sparked by back-to-back baskets from Romeo and powered by six points Troy Roasario. The bench mob took over from there. They went on a 20-8 run to close the first period after Columbian had cut their lead down to single digits. TNT continued their romp throughout the game. Joshua Smith powered his way into the paint the second quarter to build the lead to more than 30 points. The KaTropa held on to that margin in the third quarter as Rosario, Romeo and Jericho Cruz dropped bombs in the third period. The lead ballooned to as big as 40 points early in the final period after a Romeo three-pointer. Rosario was excellent throughout the game. He led the team with 21 points on 71% shooting. Romeo had an all-around game with 19 points, seven rebounds and five assists. Cruz scored 17 points and had seven assists. Smith, Kelly Williams and Don Trollano each scored 11 points. The Meralco Bolts got big games Arinze Onuaku and Chris Newsome to overcome the return of Justin Brownlee to Barangay Ginebra. Meralco handed Ginebra their fourth loss while taking their fourth win in the conference. It was a rough start for the Barangay. Their offense couldn’t engage in the first two minutes of the game. In that span, the Bolts ran out to a 7-0 lead behind buckets from Onuaku, Jared Dillinger and Cliff Hodge. Ginebra was playing catch-up the entire game. 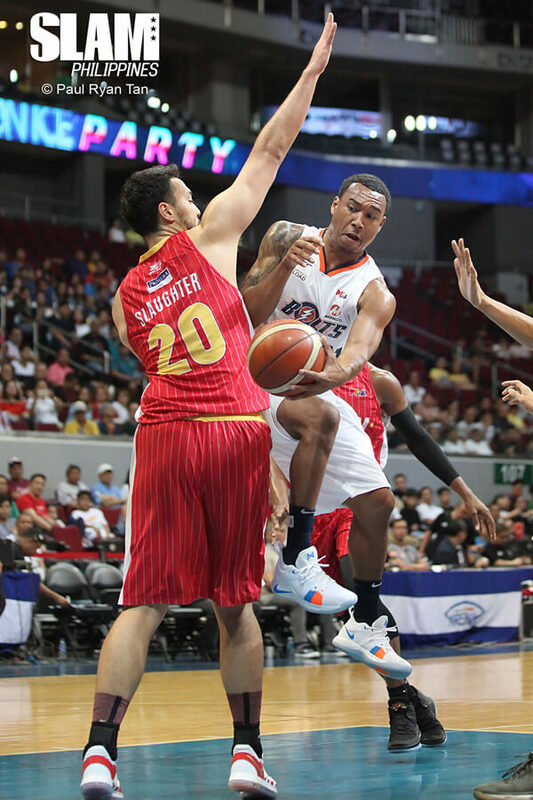 Newsome scored five points midway through the first period as Meralco took a six point lead after the first period. Ginebra couldn’t cut down the lead in the second period even with excellent production from Brownlee. That allowed Meralco to pull away from Ginebra in the third quarter. Ginebra once again stumbled out of the gates in the second half. They only managed to score 16 points while Meralco put up 25 points in the third period. Newsome and Onuaku teamed up to lead the Bolts to a 9-2 run as they built a 14-point lead midway through the third period. Onuaku and Ranidel De Ocampo each hit a trey late in the period to increase the lead to 17. Ginebra tried to cut the lead the in the fourth period but could only get as close as 10 points. Onuaku had 24 points and 23 rebounds while Newsome had 22 points and five assists. Merlaco shot an even 50% from the field while they held Ginebra to just 39% shooting.